Black with grey and white in sizes XS-2XL. Embroidered logo. 100% 240T polyester pongee with water resistant finish. Lining is 100% polyester micro mesh in body & taffeta in sleeves. 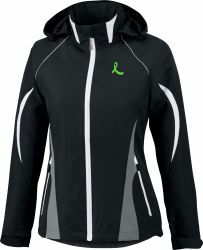 Detachable zip off, rollaway hood. Drawcord at hem & zippered front pockets.